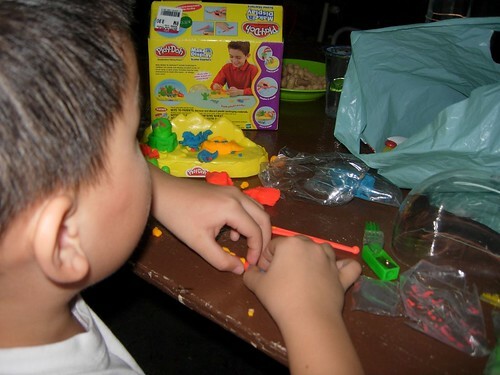 I bought a box of Playdoh (original, not pirated ok?) for my little boy before we went ‘there’. (previous post) He enjoyed it so much, he never bugged me for the whole 5 hours we were there. Anyway…about this One 5xmom, 40 hungry teens. My two sons have some talent camp at church. It is a four-day camp. So, feeling very brave, I told the facilitator that I shall sponsored one lunch for them today (Friday). I am going to cook the followings for them. Single handedly. So, if I don’t reply some of your comments, please excuse me. I busy lah. My son asked me, “Eh, sure you can cook enough foods for 40 people? Hungry teens, you know?” That is like 40 x 3 persons appetite. I told him, “Chey…I only need to cook for five persons and then, I ask Jesus to multiply it, ok?” I also told my church clerk I am going to bring her lunch. If that’s not daring enough, I also asked Ann Marie (that’s Nicole David’s mom, OMG, the squash champion!) to join us for lunch. I slotted this post because I need to make a ‘regular’ post to make my blog more ‘family oriented’. 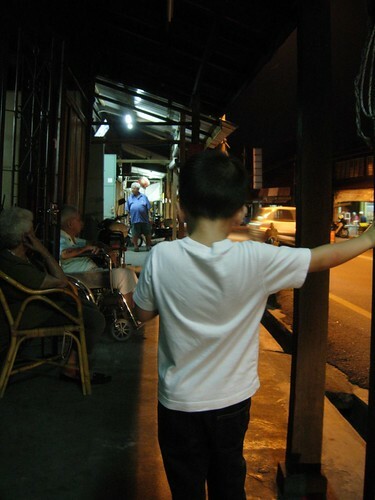 I love this photo of my son standing at this small pekan (village) five foot way with some of the old folks watching the sun went down. So rustic and ethnic. Also sort of remind us about happy childhood and lonely old age, the circle of life that we cannot run away from. Next Next post: Exactly what is love? Five foot way like this I think in Penang can be found in Balik Pulau or Teluk Kumbar only. Got this sort of spesel feeling in the last pic … i very like! Wingzs last blog post..Kopitiam Blowater – Our Petrol Still Cheap leh! Si heng – Wuah, long time no see! Yes, got feel type of photo. Like Astro ad like that. Bryan – Talk about this stupid planning, they developed Balik Pulau so much and then, never improve Bayan Lepas and Telok Kumbar. Now, the traffic bottle-neck over there and the jam is hellish. Yea, traffic at Telok Kumbar near the school there is the most terrible wan. Any more of that “5 loaves and 12 fishes” meal left over? *brings tupperware* I’m a fan of baked beans and mac n cheese too. corren – Yalor, I think I got superpower cos I not only cook, I sindiri went to Tesco and buy the stuffs cos hubby was busy. giddy tigress – Actually it is 4 chicken, two packet of meehoon, 30 sausages, 2 tins of beans, 10 eggs, 12 cups of rice and lots of vege and sauces. I didn’t manage the pasta cos they wanted early lunch and I didn’t have enough stoves to cook simultaneously. wingz – Lying low good lah, views from the bottom is refreshing, can see upskirts. bryan – Yalor, really boh nau wan, they spend a lot of money to cut through a hill to straigten a road between Telok Kumbar and Balik Pulau when they can just let people drive an extra five minutes to enjoy the nice views. Talk about them, can vomit blood. This one is BN PUNYA KERJA.